This is a challenging tour. 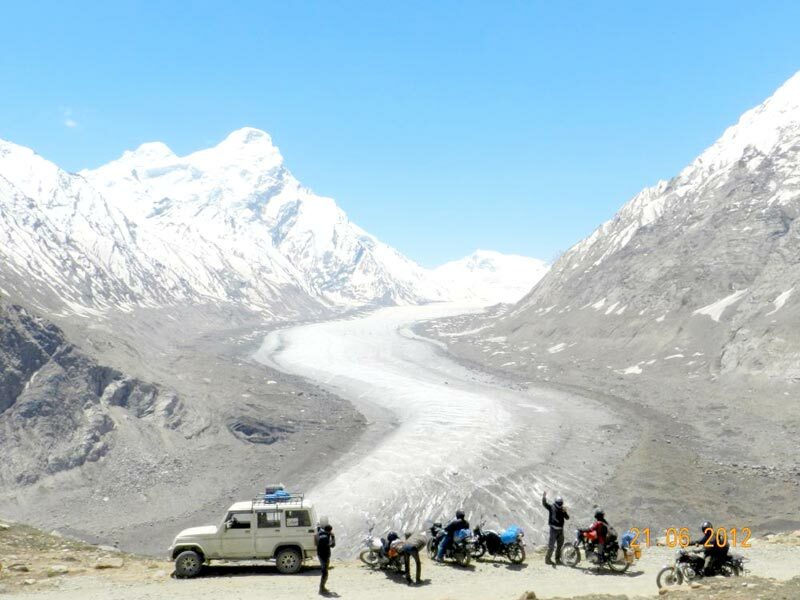 Solid riding skills, a sense of adventure and flexibility are a must when taking part in our Himalaya expeditions, which cover around 2000 km and considerable altitude differences. 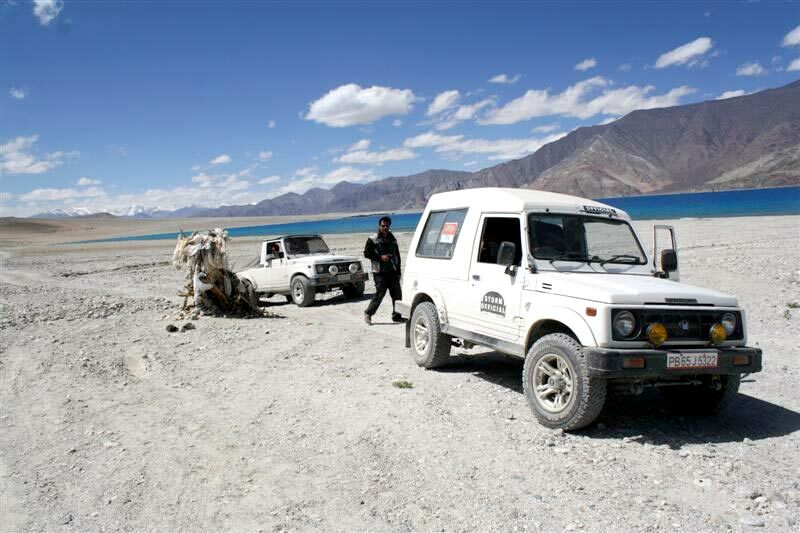 Road conditions vary from freshly paved to rough tracks.This tour is a mystical "river journey" to wild Zanskar Valley, hidden in the remotest reaches of the Himalayas.After crossing rocky valleys and passes to the mouth of the Suru River near Kargil, the gateway to Zanskar Valley. 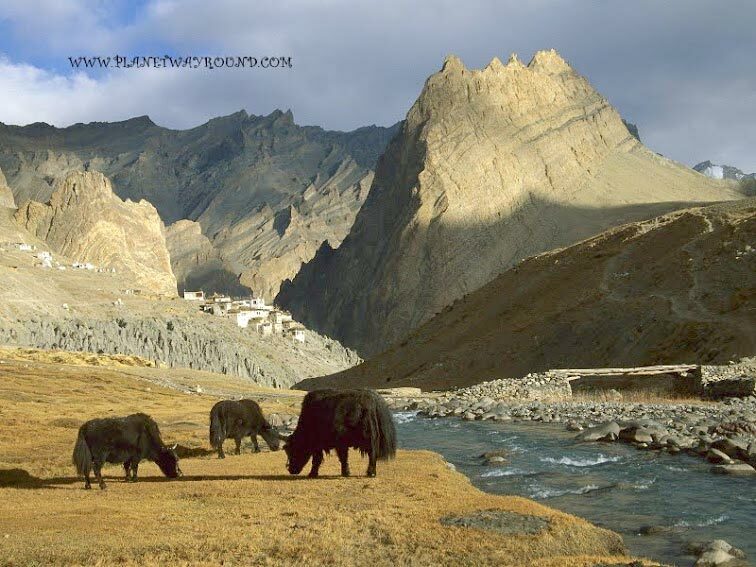 Our route takes us up the wild, rugged valley on a steady climb to Penzi La pass (4,400 m) the only road into Zanskar. 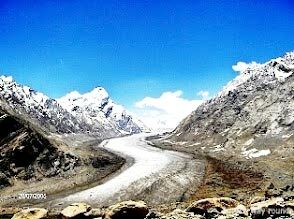 We’ll be passing enormous glaciers on our way into the valley. 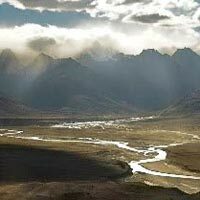 We’ll slowly work our way up the rough tracks to our destination in Padum.After exploring Zanskar, get to know the highlights of the Indus Valley. 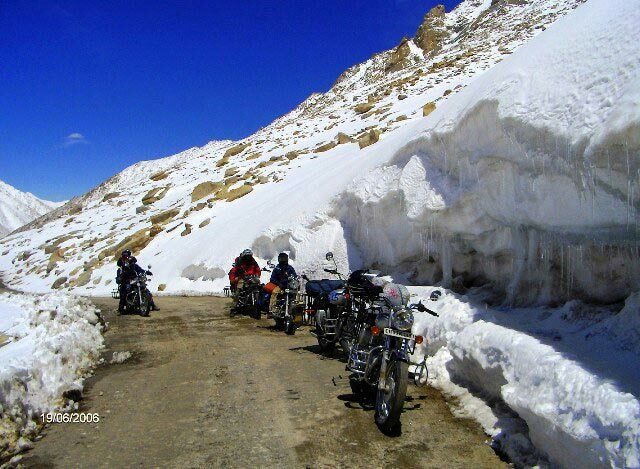 Last but not least, the ultimate high point - one that can also be measured in terms of altitude - The Khardung La, the highest pass in the world, of 5,605 meters.Package A: Security deposit for the rented bike (40% cost of bike ) & Extra days bike rent . Extra luggage care vehicle cost will be shared by the group , as per requirement . Any Kind of personal expenses or optional tours, extra meals, starters etc. Package B: Bike Booking cost /Bike Rent/Security deposit. Extra luggage care vehicle cost will Share by group ,as per requirement . Extra guide fee, Camera & Video fee, Boat and rope trolley fee. Package C:All Meals. Pay as per your taste. Bike Rent and All Fuel. Extra luggage care vehicle cost will Share by group ,as per requirement. Day 1: Chandigarh to Amritsar, 230 Kms. We start our journey Chandigarh to Zanskar stopping at Amritsar. Today we cross Jalander, in the evening we visit a golden temple and city and overnight stay at Amritsar city. Day 2: Amritsar to Patnitop, 285 Kms. Post breakfast we check out and drive to Patanitop today we will cross Jammu. Day 3: Patnitop to Srinagar, 170Kms. Day 4: Srinagar to Kargil, 200km. 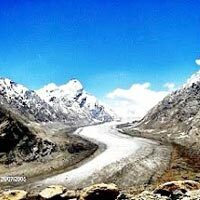 At the start of our tour ,we will enjoy the beautiful green valley, and cross Jojila Pass (4300m) Today we will reach Kargel ,we covered Dass (world 2nd coldest habitat area) We’ll then descend into Baltistan Valley to the Garrison City Kargil, the gateway to Zanskar Valley. A hotel at the bazaar (2,600 m) will be our home for the night..
Day 5: Kargil to Ranggum, 130 Kms. 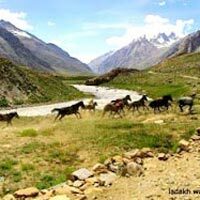 We drive to Rangdum Through the beautiful wild Suru valley – We’ll be leaving paved roads behind today, continuing on a dusty track at average speeds of around 20-40 kmph. 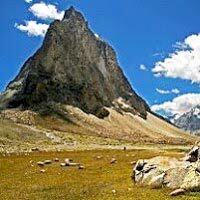 Ascending to the herdsman’s village of Parkachik,and reaching Rangdum. 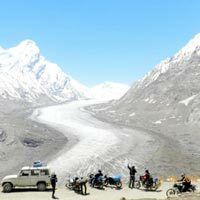 Day 6: Rangdum to Padum, 90Km. 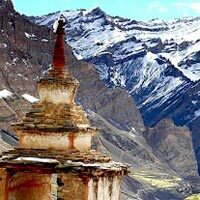 Start to the Rangdom in the morning Today, we’ll ascend the adventurous track further until we reach Penzi La pass (4,401 m) and visit the tiny Rangdum Mountain Monastery before descending along a huge glacier at the entrance to Zanskar Valley and reaching Padum Valley. 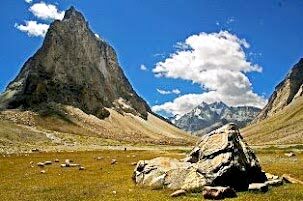 Today no ride, we visit surrounding the Padum the only small town in Zanskar. Only around 1,000 people live here in the summer. 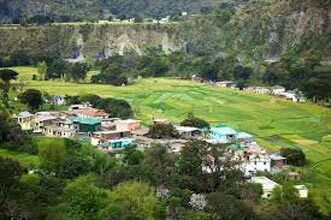 In the afternoon, we’ll visit the Karsha monastery, a medieval oasis of peace and an important center of the Buddhist faith. 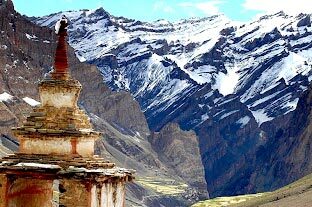 We’ll be spending the night in the best guest house in Zanskar, at an altitude of approx. 3,500. 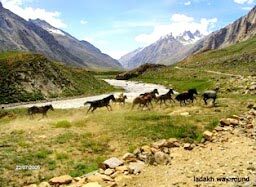 Day 8: Padum (Zanskar Valley) to Parkachik, 170 km. Our return trip starts with a longer ride. 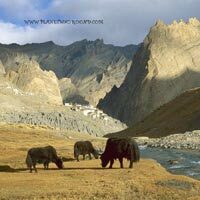 We’ll be crossing Penzi La pass (4,401 m) and spending another night on a meadow near Parkachik Glacier. 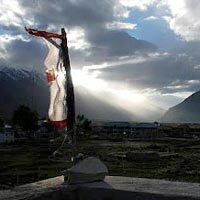 Descending through Suru Valley to Kargil, we’ll come across our first filling station in 550 km! 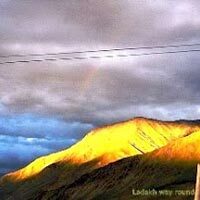 Crossing the Fatu La pass, we’ll reach the Lamayuru Monastery, setting up our?? 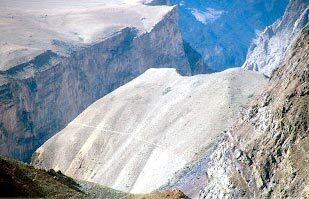 there at an altitude of around 3,800 meters. Day 10: Lamayuru to Leh, 140km. We’ll have the opportunity to witness the morning meditation in the monastery - an unforgettable experience. 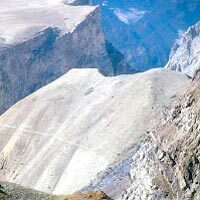 Next, a steep descent to the Indus Valley. 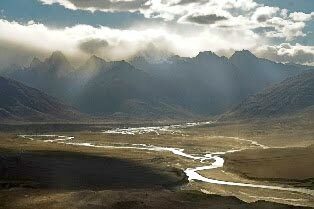 Our next track starts at the confluence of the Indus and Zanskar rivers. 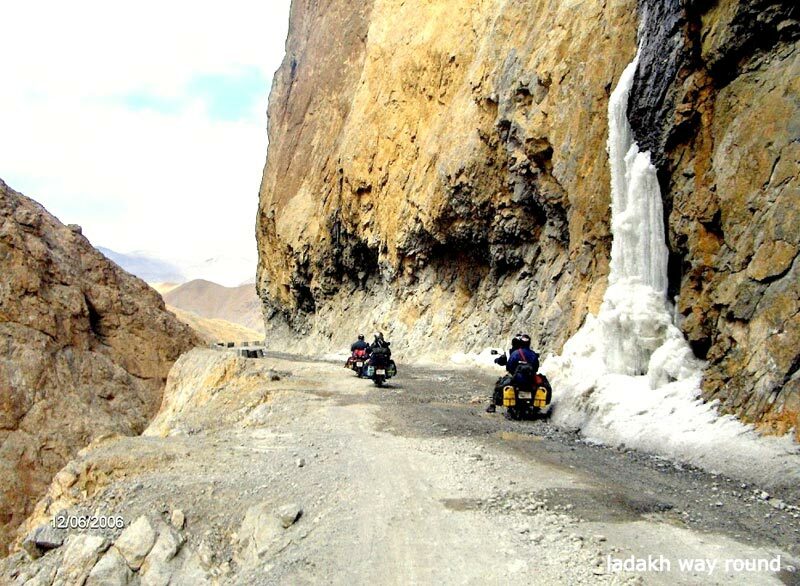 The 40 km along the wild Zanskar river to Chilling, a village of coppersmiths, is one of the most breathtaking motorcycle routes anywhere in the Himalayas! 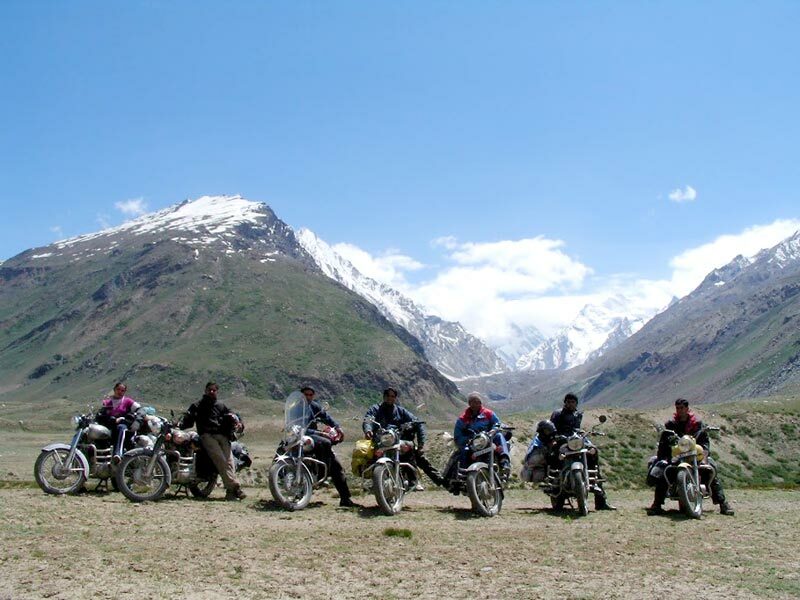 We’ll be reaching Leh – the end of our motorcycle tour. Day 11: Day trip to Khardung La, the world’s highest pass! 110 km. Today we’ll be reaching the high point of our tour - literally. 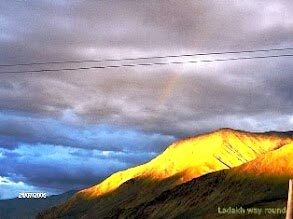 50 km on the road and 2,000 meters ascent to Khardung La pass, the highest motorable road in the world. There’s nothing else like it! There will be time for relaxation and shopping in the afternoon, followed by a farewell dinner with the crew. 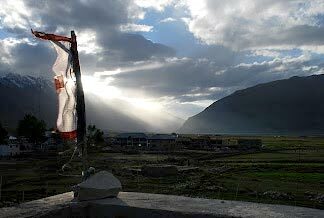 Post Breakfast we proceed for Indus Valley Monastery tour including Shey, the ancient capital of Ladakh, Thicksey, an impressive complex rising tier upon tier on a hill above the village, & Hemis Gompa the largest monastic foundation of Drukpa Kagyu Order of Tibetan Buddhism. Stok Palace & Sindhu Ghat. Overnight at hotel. Day 13: Leh to Sarchu, 255Km. Post breakfast we check out of the guest house and proceed towards Sarchu, enroute Stopping at Tanglangla pass, the second highest Motorable pass in the world at 5350 m. overnight stopover at Sarchu (4253 m), bordering the states of Himachal Pradesh (Lahaul), Jammu and Kashmir (Ladakh). Upon arrival in Sarchu we check in at our tented campsite for overnight stay. Day 14: Sarchu to Manali, 222Km. Leave for Manali by early Morning, Breakfast at Bharatpur, cross Baralacha Pass (16020 ft), Enter Lahaul Valley,a break at Keylong for lunch, Passing by Koksar, Tandi (where Chandra River meets Bhaga River), Crossing Rohtang Pass (13050 ft), an evening tea break at Marhi, We’ll be reaching Manali - the end of our motorcycle tour – in the late afternoon. Package A: Security deposit for the rented bike (40% cost of bike ) & Extra days bike rent . Bookings and Payments: Bookings are confirmed on advance payment of 50%, with the remaining 50% to be paid at least 7 days prior to departure. Payments can be made by online bank deposit or demand draft. for package C 100% deposit in advance for booking . Package C, If all in the group join / sing up with same pack then cost applicable. Offroading 4×4 Trip Till The Edge Of The ..